We must respect the other fellow’s religion, but only in the sense and to the extent that we respect his theory that his wife is beautiful and his children smart. Adherents.com is a growing collection of over 43,870 adherent statistics and religious geography citations: references to published membership/adherent statistics and congregation statistics for over 4,200 religions, churches, denominations, religious bodies, faith groups, tribes, cultures, movements, ultimate concerns, etc. The religions of the world are enumerated here. …discover the religious affiliations of influential and famous adherents of over 100 different religious groups (famous Methodists, famous Jews, famous Catholics, famous Zoroastrians, famous Jehovah’s Witnesses, famous Theosophists, etc. ), and lists of prominent people (actors, politicians, authors, U.S. presidents, artists, musicians, Supreme Court justices, film directors, etc.) classified by religious affiliation. These lists are linked to thousands of detailed religious/spiritual biographies. 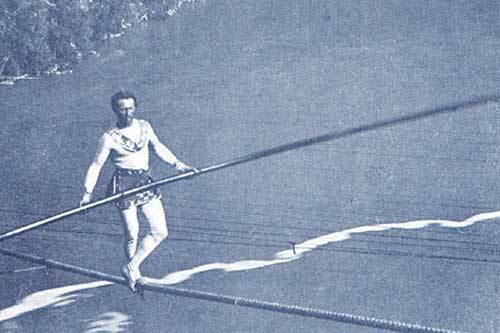 As we commune with our comics, we might recall that it was on this date in 1859 that Jean François Gravelet-Blondin, the tightrope walker better known as Charles Blondin, crossed Niagara Falls for the first time on an 1100 feet high wire (160 feet above the water) near the location of the current Rainbow Bridge. He crossed the Falls several time subsequently, always with different theatrical variations: blindfolded; in a sack; trundling a wheelbarrow; on stilts; carrying his manager, Harry Colcord, on his back; and finally, sitting down midway while he cooked and ate an omelet, standing on a chair with only one chair leg on the rope.